Aviation Updates Philippines - National flag carrier, Philippine Airlines has commenced flying to its sixth destination in Japan—Sapporo in Hokkaido prefecture. The inaugural flight departed on Monday, December 10 after several months of delays due to the impacts caused by a strong earthquake in September. 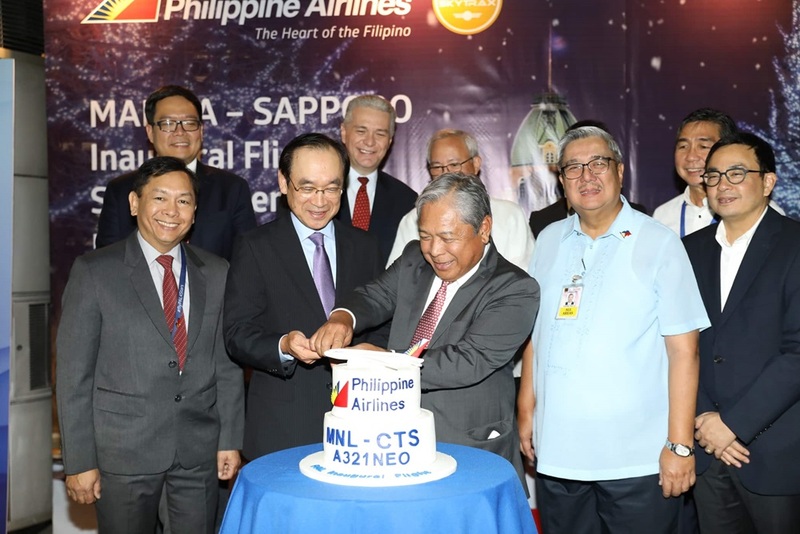 Nevertheless, the carrier took pride in becoming the first airline to fly direct from Sapporo and Manila with its state-of-the-art Airbus A321-271neo fleet. The maiden flight was sent off by Japanese Ambassador to the Philippines Koji Haneda and PAL President and Chief Operating Officer Jaime J. Bautista at the Ninoy Aquino International Airport (NAIA) Terminal 2 through a short program with the cake-cutting ceremony as its highlight. The nearly six-hour long flights are scheduled thrice weekly every Monday, Wednesday, and Friday. PR406 departs Manila at 1:55 am PST and arrives at Chitose at 8:30 am JST. The return flight, PR405, departs an hour and fifteen minutes later and arrives back in the Philippines at 2:15 pm. Aside from Sapporo, PAL flies to Fukuoka, Nagoya, Osaka Kansai, Tokyo-Haneda and Tokyo-Narita. The four-star airline presently operates a fleet of five Airbus A321neoLR aircraft. 16 more of the type are expected to arrive in the coming years. The new aircraft can fly 168 passengers in a dual-class configuration up to 4,000 nautical miles non-stop.